Chloe E. Bird Peter Conrad - Chloe E. Bird, PhD, is a senior sociologist with the RAND Corporation, a nonprofit, nonpartisan research organization in Santa Monica, California. She is also Professor of Sociology at Pardee RAND Graduate School. Her research examines gender and racial/ethnic differences in the physical and mental health of individuals and in the health care they receive. She is particularly interested in how neighborhood characteristics—from their socioeconomic composition and degree of economic segregation to their air quality and walkability—might contribute to these gender and racial/ethnic health differences. Dr. Bird is Associate Editor of Women’s Health Issues, and has been Chair of the Medical Sociology Section of the American Sociological Association (ASA). She has published extensively in a wide range of journals, and has co-authored numerous book chapters and reports. 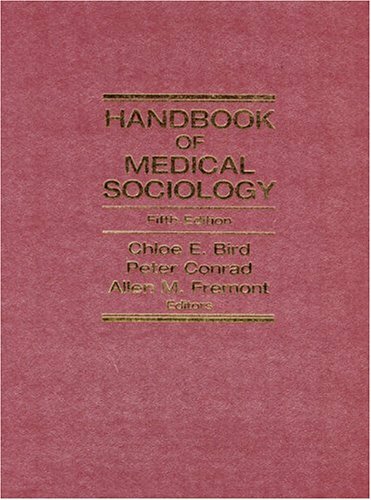 Among the honors bestowed on her work is the 1995 Elliot Freidson Award from the Medical Sociology Section of the ASA. In 2006, the Rockefeller Foundation awarded her a month-long collaborative residency at its Bellagio Center in Italy to research and write chapters of Gender and Health: The Effects of Constrained Choice and Social Policies. Dr. Bird is married to Dr. Allen Fremont, a physician, sociologist, and health services researcher at RAND. They have two very lively young sons.